I made a rather daunting and perhaps hasty new year’s resolution: to go on a shopping fast. To not buy any clothes for myself for a whole year. No scarves, no t-shirts, no half-priced dresses. No shoes or purses for that matter either. Or belts. Or flip-flops. Or even socks, given that the dryer monster doesn’t devour all of mine. Why? Because one day, about a month ago, I opened up my closest and felt a surge of disgust. Why, why, do I have all of this stuff? 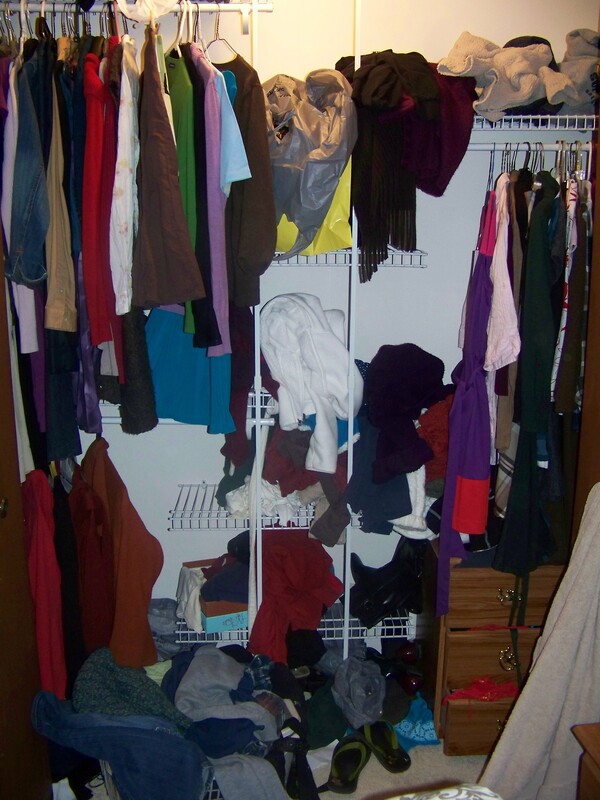 All of these sweaters sliding off of hangers, all of these dresses that only see the light of day during wedding season, all these pieces of fabric that need to be washed and dried and folded, but so often end up in a heap on the floor. Forgotten, wrinkled, neglected, even despised for the room they take up. Before I go any further, this isn’t a prescription post, a you-should-do-this-too post. This is what I felt nudged to do—a quiet but steady tugging on my heart. And I’m really not doing this in hopes of saving a bundle of money because, in all honesty, I won’t. I am a die-hard bargain hunter. I live for clearance racks and the Land End’s sale where I can stock up on $1 pants. (The Land’s End sale! Oh precious my precious, I forgot! Breathe. Breathe.) A sleeveless dress hangs in my closest sporting a $6.40 price tag because the little beauty was off-season and 90% off. It’s not that I overspend, it’s that I overshop, and I’ve lost sight of need and want. Wanting something is not bad and fashion is not bad, but that little tugging on my heart said you have enough. No, more than enough. You have excess. I mean how many pair of pants does a girl need, even if they are only a buck? Sometimes my frugality actually hinders me because it’s so easy to justify the purchase. But it’s been hard, already, and it’s only January 13th. The other day I was traipsing through my favorite store, coupon in hand, (I won’t tell you the name of the store but it rhymes with “moles”) searching for birthday presents for my daughter and sister and, as everybody knows, the clearance racks in January swell with deals, shiny chrome racks loaded with rainbows of possibilities. Suddenly forbidden fruit (albeit temporarily). And it all looked so yummy. All those colors. Cottons and knits and silks just waiting for me to finger through. All those 75% off sweaters. My toes involuntarily pointed in their direction but I thought of my spewing closet and redirected them to house wares. Hopefully I won’t be trading one species of indulgence for another. And hopefully my daughter won’t end up being the best dressed soon to be eight year old because her mother starts shopping vicariously through her. I know. But I’m on the road to recovery.